Sharp-eyed satirist, deft observer of the natural world, accomplished draftsman, frenzied expressionist—as an artist, John Alexander is hard to pin down. 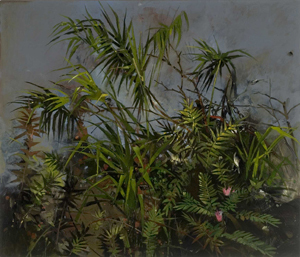 In his 40-year career, he has gone through periods in which he’s turned a critical eye on the social and political scene; years when he’s dedicated himself to honing his drawing skills to the level of an Old Master; times of painting lush landscapes, bursting still lifes, and churning seascapes; and an explosive phase in the late 1970s and early ’80s when it seemed he was about to transform into a full-blown abstractionist. The lack of a consistent, identifiable style makes it difficult for curators, critics, and collectors to get a handle on this multi-talented artist. The only continuum has been a fierce commitment to whatever happens to engage his sensibilities. “Everything is connected to my life and my feelings and my foibles and what makes me angry and what makes me happy,” he says. The idea for Ship of Fools, inspired partly by a painting of the same name by Hieronymus Bosch, had been developing for some 20 years. “I just kept thinking about it and thinking about it. Finally I saw in my mind how to make it. It just fits in with all these strange things I’ve been doing lately.” Those “strange things” include flag-waving bureaucrats, a screaming monkey’s head, a portrait of Richard Nixon, and another large canvas, The Parade (2006). Like Ship of Fools, that painting is an assemblage of ghoulish creatures, a nightmarish gathering of doomed souls that seems to condemn the current sociopolitical climate without pointing a finger at specific targets. His family encouraged Alexander, who wanted to be an artist from the age of ten. He was given a set of paints for Christmas and spent the holidays recording the world around him. His father regularly took him camping and fishing, and the bayou country became a favorite subject (a painting he made at the age of 15, Neches River, is included in the book). He was developing a taste for the music that he says he is still “obsessed with”—blues, gospel, and postwar country by musicians like Hank Williams. But when it came to visual arts, he had few models. There were no galleries or art museums in the area, and “not only did we not have art in our house,” he says, “I didn”t know anyone who did.” His sources of visual stimulus were the magazines of the day, Look, Life, the Saturday Evening Post, and even Popular Mechanics. It wasn’t until he went to college at Lamar University in Beaumont and met a young teacher named Jerry Newman that Alexander could begin to acquire a solid academic foundation in drawing, painting, and art history. Newman’s instruction was rigorous and intense, including night classes spent drawing from models and still-life arrangements, and making copies after the Old Masters. “This whole approach was disappearing from college art education in the United States, so I feel lucky to have been at Lamar when I was,” Alexander told Livingston. After graduation, Alexander spent two years teaching high school as a way to avoid the draft. He describes the Vietnam War as an experience that “radicalized” him politically and led him to distrust authority figures of all kinds. By the early ’70s, he had earned his M.F.A. from Southern Methodist University in Dallas, which boasted a first-rate faculty and an ambitious visiting-artist program, and had accepted a position teaching at the University of Houston. He and his first wife, Wanda Brod, fell into the city’s lively, burgeoning art scene, which included James Surls, Dan Rizzie, and James Hill, as well as the forceful presence of John and Dominique de Menil. Alexander’s first mature landscapes date from this period, and he enjoyed critically successful and remunerative shows at Meredith Long & Company. These works are generally bleak and often haunting, filled with ominous shadows and realized in a limited palette of ochres and mauves along with black, white, and gray. A few years later, James Harithas, the charismatic director of Houston’s Contemporary Arts Museum, saw some offhand scribbles and freewheeling sketches the artist had been working on and encouraged him in that direction. Alexander moved into looser, more expressionist territory with canvases like Cry Me a River (1978) and Caught in the Act (1976). By this time, he was forging connections with dealers like Betty Parsons and Max Hutchinson and visiting New York regularly. There the gregarious artist began hanging out with a cluster of young talents like performance artist Van Schley, actors Bill Murray and Dan Aykroyd, Saturday Night Live creator Lorne Michaels, and comedy writer Rosie Shuster. After his marriage dissolved in 1978, he decided to quit his teaching job and move full-time to New York, where he married Shuster and settled in the studio he still call home. “I was around a group of very bright and talented people, and it was truly like somebody going into a psychiatrist’s office wound up tight and for the first time just openly weeping and letting go,” he explains. “I was exorcising my own demons.” As Alexander acknowledges, such vulnerability and openness is difficult to maintain for more than a few years, and by the end of the decade he had returned to a more conventional kind of representation. At times he would revisit this forthrightness, as in Venus and Adonis (1989), a haunting parable about the breakup of his second marriage in which a masked couple confront each other in bed as their bodies are consumed by flames. In the mid-’90s, he settled happily into family life when he met his current wife, Fiona Waterstreet, and adopted her son, Harry, now a senior in boarding school. When Alexander turned 50, he consciously turned back to studying his subjects firsthand. “I want to readdress myself to my craft. I need to become more skillful, and the only way to do that is to work in a traditional way, from observation,” he told a group of students at the Rhode Island School of Design in 1996. The results of that approach have included sea- and landscapes that recall the painters he studied so many years ago in the Art Institute of Chicago, lush and exuberant still lifes, and meticulously realized drawings of flowers and animals. The last decade has been particularly rewarding for the artist, who divides his time between New York in the winter and a home and studio in Long Island’s East in the summer. He shows widely, most regularly with Gerald Peters Gallery in Dallas (where drawings range from $8,000 to $10,000 and large paintings can go for $150,000) and most recently at the Rhode Island School of Design in 1996 Eaton Fine Art in West Palm Beach, where a survey of prints is currently on view. His extracurricular activities include fishing, frequent travel, and following the minor-league baseball teams he co-owns with his old friend Van Schley.